Price Includes: Air/Bus/Transportation//Breakfast/Dinner/Sightseeing per Itinerary/Local guides & Tour leader service/tickets/hotels/all taxes. Not included: Lunch, Insurance, alcoholic drinks and tips. Day 1 - Depart Chicago O’Hare Airport. Day 2,3,4 - Upon arrival in Rome, meet Fr. Louis and our tour leader to begin our three day visit to the Eternal City. 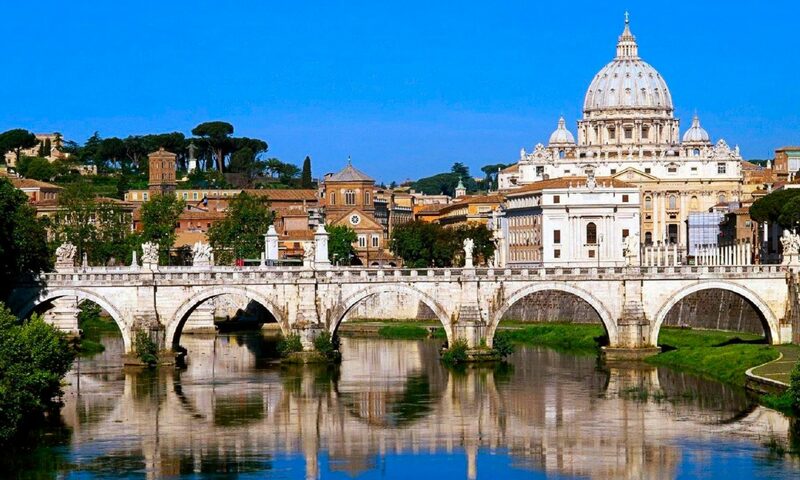 We will visit the 4 major basilicas of Rome including St. John Lateran, the Cathedral of Rome, St. Mary Major, St. Paul Outside the Walls built over the burial place of St. Paul and St. Peter Basilica to venerate the tombs of the Popes including St. Peter and St. Pope John Paul II. Additional sightseeings includes the Vatican Museums, the Sistine Chapel to see Michelangelo’s The Creation of Adam ceiling fresco, Raphael’s Rooms, Gallery of the Maps and Bramante’s Pinecone Courtyard. General Audience with Pope Francis (subject to Pope’s availability), Ancient Rome, the Roman Colosseum, Roman Forum and the Scala Sancta (Holy Stairs), transported from Jerusalem to Rome around 326 AD by St. Helena, Emperor Constantine’s mother. Breakfasts and dinners at hotel in Rome. Before heading to San Giovanni Rotondo, we will first stop at Monte Sant’Angelo where St. Michael the Archangel appeared in 490, 492, and 1656 . The shrine has been visited by St. Francis of Assisi, St. Bernard of Clairvaux, St. Bridget of Sweden, St. Gerard Majella, St. William of Vercelli and six popes who made the pilgrimage there to ask for St. Michael's protection. At. San Giovanni Rotondo, we will visit the Friary of Padre Pio, including Santa Maria Delle Grazie (Old Church) his tomb, cell, confessional, and the Padre Pio Pilgrimage Church(New Church). Dinner and Overnight at San Giovanni Rotondo. After breakfast, transfer to Manopello to view the Veil of Veronica before departing for Lanciano home of the Sanctuary of the Eucharistic Miracle Dinner & Overnight in Lanciano. We will continue our journey after breakfast to Loreto Sanctuary, where, according to tradition, angels transported the home of the blessed Virgin Mary. In the evening, we transfer to Ancona to board ship for a night cruise to Split. Dinner & breakfast on board. arriving at our final destination of Medjugorje to share in faith with pilgrims from around the world to venerate the sites of the apparitions of the Blessed Virgin Mary, Queen of Peace. Each evening at 5PM or 6PM daylight savings time, join the villagers and fellow pilgrims of Medjugorje in saying the Rosary as we anxiously await the alleged arrival of Our Lady to the visionaries. Following the apparition, is the Croatian Mass, and a Blessing of the Sick. Dinner & Overnight in Medjugorje. Climb Mt. Krizevac (Cross Mountain), Apparition Hill and visit the Community of Cenacolo. Breakfast, Dinner & Overnight in Medjugorje. After breakfast, depart for Sarajevo to say farewell to Fr. Louis and our tour leader as we return back to the US. Contact Toni Pietrowski at 630-699-3482 or toni@stchristophertravel.com for further information, departure from other locations and travel insurance.